Holencik offers gutter cleaning services on an as needed basis or we have maintanence contracts available. We offer a once or twice a year contracts which consist of a spring and fall cleaning. We will come to your home twice a year and take the worry of gutter maintenance off your mind! Clogged gutters are the number one cause of basement water problems. Roof water overflows and accumulates around the foundation. If this happens, basement leaks may be moments away. Excess water against the foundation wall can weaken the footing and lead to cracks. This is particularly true in the colder months when built-up water at the foundation freezes and causes a condition known as “frost-heave” which can cause severe cracks to foundation walls. Water backing up from clogged gutters will cause moisture damage to the wood fascia around the house. 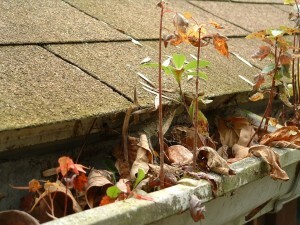 The rotted area will get worse quickly if the leak is not eliminated by cleaning the gutters. In winter, ice-dams can form on top of clogged gutters. Then snow builds up across the top of the gutter and freezes. During the next thaw, water running off the roof is blocked by the frozen snow and backs up into the house. This can lead to major wall and ceiling damage. Overflowing gutters can deposit water on walks and driveways where it can freeze and cause a slipping hazard. Avoid this problem by keeping gutters clean and the spouts extended away from any traffic areas. Misdirected and clogged gutter spouts often cause driveways and walks to sag and crack. Any newly installed plants, grass or trees can be killed by excess water. Overflowing gutters can cause severe erosion and put and early end to young plantings. Bugs love moisture. Keeping the soil dry around the foundation perimeter can force bugs to go elsewhere for a tasty snack of dampened two-by-four.